The mammalian retina has long been a model system for study of development of neural circuits in the CNS because the adult network is well organized into cell-type specific layers, and the anatomy, physiology and function of many of the retinal cell types is well characterized. A major focus of research in the retina is directed toward understanding how functional circuits arise during development. The development of the retina requires several steps. The first step is to create the right proportion of the 7 cell types that comprise the retina. This process occurs primarily through genesis of the correct number of each cell type. Only ganglion cells have their final number regulated by cell death, which reduces the number of ganglion cells by as much as 50% in some species. The second step is for cells to migrate into the correct location. The third step is for neurons to form synaptic connections with other retinal neurons. Finally, for some of these groups of synaptically coupled cells, synaptic refinement is necessary to generate the circuits that comprise the adult retina. Figure 1. Golgi stained embryonic mouse retina shows the differentiating cells migrating to the correct layer of the retina. From Cajal, Translation 1933. 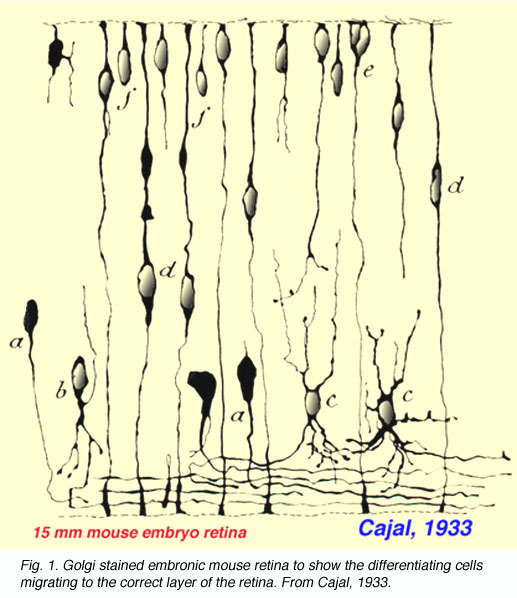 The process of neuronal migration in the retina has been the focus of developmental biologists since the time of Cajal, who used Golgi staining techniques (Fig. 1). Progenitor cells in the neurepithelium lining the surface of the neural tube later become the ventricular zone of the optic vesicles, optic cup and early retina. Postmitotic cells leave the ventricular zone to migrate to one of three cell layers in the retina remaining attached radially from one side of the retina to the other. The neural cells lie at different levels in the retina and, when in correct position, lose their anchoring radial connections. Then polarity of the differentiating cells occurs and dendrites and axons grow out appropriately. The ganglion cells are the first to emerge as recognizable neurons with axons passing to the optic nerve and central brain structures (Fig. 1a and b). Then amacrine cells (Fig. 1c), Muller cells, bipolar cells (Fig. 1d), and horizontal cells form in the correct layer and finally photoreceptors remain to line the top layers (Fig. 1e and f). Before the neural circuits that underlie visual processing emerge, the retina assembles and disassembles a series of intermediate circuits. These transient connections between cells produce the propagating spontaneous activity that is termed retinal waves (Meister et al., 1991; Penn et al., 1994; Feller et al., 1996). As the retina develops, so do the circuits that underlie retinal waves. The earliest spontaneous retinal waves are propagated via electrical coupling between cells. Then, around birth in mice, waves are produced by a transient network consisting of cholinergic connections between amacrine cells. Finally, just before visual processing begins, they are driven by early glutamatergic signaling. In this chapter we will discuss how these transient circuits of the inner plexiform layer (IPL) assemble to produce specific patterns of neural activity, and how they transition from one circuit into the next. Finally, we will discuss the role of spontaneous activity in shaping the development of the visual system within both the retina and the brain. Early in development, neurotransmitters can function in the absence of traditional synapses (Redburn and Rowe-Rendleman, 1996). Ultrastructurally identified conventional synapses within the IPL are first formed a few days after birth in mice (Fisher, 1979). However, even before that there is evidence of neurotransmitters. Below we discuss the role of early neurotransmitters and their receptors prior to the formation of circuits that mediate vision. Acetylcholine (ACh) signaling plays a key role in the development of the retina. 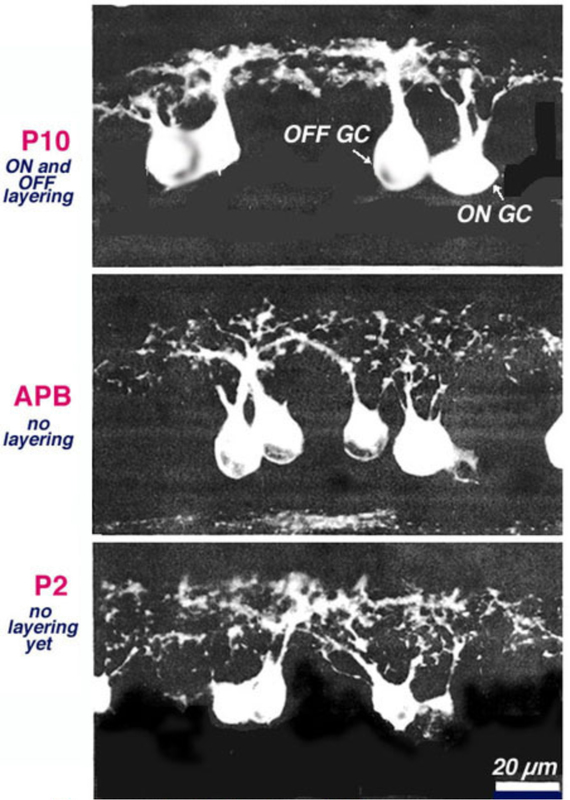 Prior to synapse formation, paracrine action of ACh is essential for regulating early developmental events, such as the regulation of the cell cycle (Pearson et al., 2002) and the growth of neurites (Lohmann et al., 2002). In addition, cholinergic synapses are among the earliest to mature and thereby constitute the earliest functional circuits in the retina. ACh in the retina is produced solely by one cell type, the starburst amacrine cell (SAC), a type of amacrine cell named for its radially symmetric processes (Hayden et al., 1980). In the mature retina, released ACh acts on both muscarinic and nicotinic receptors to modulate the response properties of many different types of ganglion cells (Masland and Ames, 1976; Masland et al., 1984; Schmidt et al., 1987; Baldridge, 1996; Strang et al., 2005), but it does not affect the SACs themselves (Zheng et al., 2004). However, during development, cholinergic signaling does occur between SACs (Zheng et al., 2004). During the first week after birth in mice, ACh released from SACs activates nicotinic acetylcholine receptors (nAChRs) on neighboring SACs and thus gives rise to a cholinergic network. A key developmental function of this cholinergic network is the generation of retinal waves. This network appears at birth in mice and mediates the initiation and propagation of waves. Aside from the effect ACh has on ganglion and amacrine cells via nicotinic acetylcholine receptors, it also acts on the muscarinic acetylcholine receptors (mAChRs) of many cells in the neuroblastic layer (Wong, 1995; Syed et al., 2004a)(Fig. 2). Figure 2 shows the effect of acetylcholine on progenitor cells in rabbit retina. A one-day old rabbit retina is loaded with Fura-2. Images show responses to bath application of 200μM nicotine (Nic, left), which activates nicotinic acetylcholine receptors, or 100μM carbachol (CCh, right), which activates muscarinic acetylcholine receptors. Red indicates cells that had increases in intracellular calcium whereas blue indicates cells without increases in intracellular calcium (Adapted from Wong, 1995). Figure 2. Acetylcholine acts on muscarinic receptors in progenitor cells and nicotinic receptors in ganglion and amacrine cells. Adapted from Wong, 1995. The mAChRs are G-protein coupled receptors that lead to an increase in intracellular calcium via release of calcium from internal stores, as opposed to influx through ligand- or voltage-activated channels. Interestingly, the ACh released during retinal waves drives correlated mAChR-dependent calcium transients in undifferentiated cells of the ventricular zone (Fig. 2) (Syed et al., 2004a). Hence, it is possible that ACh released by retinal waves induces signaling that is important for early phases of neurogenesis and for cell migration (Martins and Pearson, 2008). 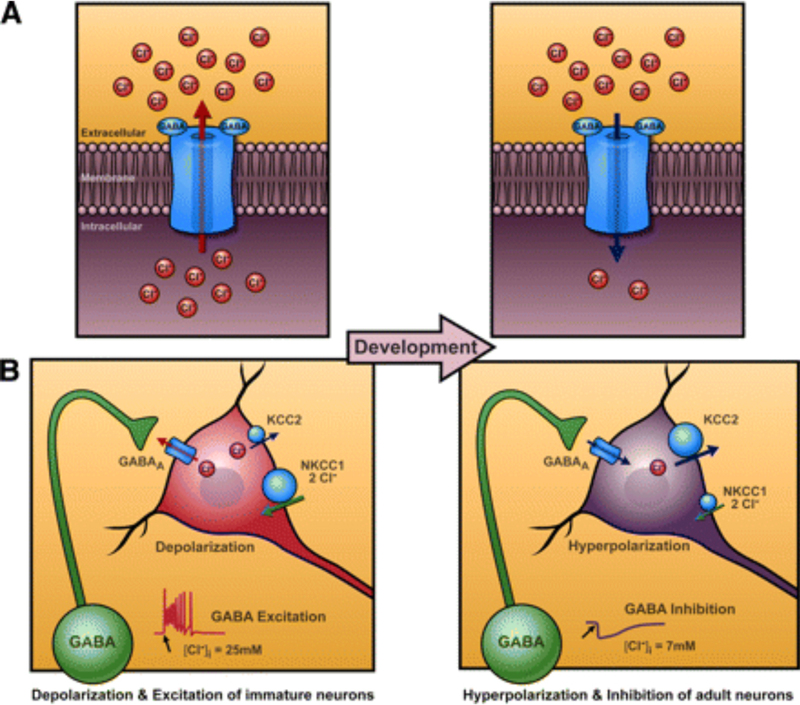 GABA is expressed in more cells during development than during adulthood, thus suggesting that it plays a transient role in circuit formation (for review, see Sandell, 1998). During the first few postnatal days in rabbit, GABA displays a high transient expression in the ganglion cell layer. Moreover, the IPL of P0 ferret exhibits markers for enzymes involved in the synthesis of GABA (Karne et al., 1997). Figure 3. GABA switches from depolarizing to hyperpolarizing during development. From Ben-Ari et al. 2007. During development, GABA initially serves to depolarize neurons. When activated, ionotropic GABA receptors, GABA-A and GABA-C, flux chloride (Fig. 3A). Since the chloride concentration within developing retinal neurons is high due to low expression of the potassium-chloride co-transporter, KCC2, receptor activation leads to an efflux of negatively charged chloride ions through the open channels and thus causes depolarization of the cell (Fig. 3A, B left). KCC2 expression gradually increases during the first two weeks after birth in mice (Zhang et al., 2006). Thus there is a ‘switch’ from excitation to inhibition as the reversal potential for chloride drops below the threshold for firing action potentials (Fig. 3 A, B right). In turtle retina, the timing of the GABA switch correlates with a decrease in propagating spontaneous activity (Sernagor et al., 2003), suggesting that GABA depolarization plays a role in this propagation. In mammalian retina, GABA plays a minor role in correlated spontaneous activity during its excitatory period (Feller et al., 1996; Syed et al., 2004b; Wang et al., 2007). However, after the GABA switch, GABA’s inhibitory action takes on a prominent role in shaping spontaneous activity. Blocking GABA-A receptors greatly increases the frequency of spontaneous retinal waves (Syed et al., 2004b; Blankenship et al., 2009). Figure 4. The GABA switch in retinal ganglion cells is due to a diffusible factor. From Barkis et al., 2010. What underlies the switch of GABA’s action from depolarizing to hyperpolarizing? Several environmental factors, including neural activity (Leitch et al., 2005), have been implicated in the timing of this switch in the retina. A recent study used acutely isolated retinas from knockout mice and pharmacological manipulations in retinal explants demonstrates that the timing of the GABA switch in retinal ganglion cells is unaffected by blocking specific neurotransmitter receptors or global activity (Barkis et al., 2010) (Fig. 4). Purified retinal ganglion cells remain depolarized by muscimol for at least two weeks in culture (Fig 4, right), indicating that the GABA switch is not cell-autonomous. Purified ganglion cells co-cultured with other retinal neurons also remain depolarized by muscimol (Fig. 4, middle). However, culturing purified ganglion cells with dissociated cells from the superior colliculus (Fig. 4, right), or treating purified ganglion cells with media conditioned by superior colliculus cultures (Fig. 4C, red), results in a switch to inhibition by muscimol after two weeks in culture, indicating that a diffusible signal independent of local circuit activity regulates the maturation of GABAergic transmission. Glutamatergic signaling is the last to develop within the IPL. Glutamate is released primarily from bipolar cells and a small subset of amacrine cells (Haverkamp and Wassle, 2004; Johnson et al., 2004). In mice, the axons of bipolar cells first express VGLUT1, the enzyme responsible for packaging glutamate into vesicles, around one week after birth (Johnson et al., 2003). Although, ribbon synapses between bipolar cells axons and the dendrites of amacrine and ganglion cells do not form until 11 days after birth (Fisher, 1979), glutamatergic currents can be measured before this (Johnson et al., 2003; Blankenship et al., 2009). Prior to photoreceptor maturation and eye opening, retinal ganglion cells periodically fire bursts of action potentials on the order of once per minute. This spontaneous rhythmic activity was first measured in fetal rat pups and was found to be highly correlated among neighboring ganglion cells (Galli and Maffei, 1988). Extracellular recordings using a multielectrode array (Meister et al., 1991) (Movie 1) and imaging of calcium transients (Movie 2) associated with bursts of action potentials (Wong et al., 1995; Feller et al., 1996) have revealed that these spontaneous bursts propagate from one cell to the next in a wavelike manner. These retinal waves are an extremely robust phenomenon, observed in a large variety of vertebrate species, including chick, turtle, mouse, rabbit, rat, ferret and cat (Wong, 1999). Movie 1. Multi-electrode array recording of cholinergic waves. 512 electrode array recording from the mouse at 37°. Each dot represents multiunit activity recorded on an electrode at that site. The size of the dot is proportional to the amplitude of the signal, and the color is proportional to the frequency of the signal. Movie is at 5× normal speed. From Stafford et al, 2009. Quicktime movie download available here. Movie 2. Calcium imaging of cholinergic waves. P3 mouse retina loaded with Oregon Green-Bapta-1AM. Playback 10x, size 800×600μm. Quicktime movie download available here. Retinal waves persist for an extended period throughout development as shown in Figure 5. However, as the retina matures, the circuitry underlying these retinal waves changes. Thus the wave generating circuits progresses through three distinct stages, reflecting the nature of the connections and the cells that are involved (Fig. 5). Figure 5. Retinal waves occur in three stages. Before birth in mice, waves are mediated by non-synaptic (NS) circuits. From around birth until 10 days after birth, waves are mediated by acetylcholine acting on nicotinic acetylcholine receptors (nAChRs). From 10 days after birth until the end of the second week, waves are mediated by ionotropic glutamate receptors. Modified from Bansal et al. 2000. The earliest waves recorded in mammals are thought to be propagated via gap junctions. Retinal waves before embryonic day 23 in rabbit persist in the presence of antagonists to ionotropic GABA, glycine, ACh, and glutamate receptors, but are completely blocked by 18β-GA, a blocker of gap junction coupling (Syed et al., 2004b). Similarly, mice prior to birth exhibit waves that are insensitive to chemical transmission antagonists (Bansal et al., 2000). How waves are initiated and propagated during this early stage of development is still not clear. During the first week after birth in ferret and mouse, neurobiotin coupling between ganglion cells of the same subtype and amacrine cells has been seen (Penn et al., 1994; Singer et al., 2001). However, ganglion cell coupling is initially weak and becomes stronger with age, while the correlations generated by waves become weaker with age (Wong et al., 1993). In addition, tracer coupling is found primarily between retinal ganglion cells of the same subtype and many other ganglion cells are not gap junction coupled. Thus, the issue of wave propagation in this early network still remains to be explored. Neurotransmitters play a modulatory role during early stage waves. At the earliest ages studied in chick retina (E8-E11), wave frequency decreases in the presence of an ACh antagonist and increases with an ACh agonist but waves are not blocked. These waves are unaffected by GABA-A and glutamate receptor antagonists (Catsicas et al., 1998). Similarly, embryonic waves in mouse are reduced in ACh receptor antagonists (Bansal et al., 2000). In addition, in rabbit, early waves are blocked by the activation of GABA-B receptors and are increased in frequency by the inhibition of these receptors (Syed et al., 2004b). Several experimental results show that chemical synaptic transmission is a prerequisite for cholinergic wave propagation. First, simultaneous whole cell voltage clamp recordings from ganglion cells demonstrate that increases in [Ca2+]i correlated across cells are driven by compound synaptic inputs (Feller et al., 1996). Second, the compound postsynaptic currents measured from ganglion cells are blocked by bath application of Cd2+, a blocker of calcium channels that are associated with transmitter release (Feller et al., 1996). Third, the periodic Ca2+ increases, action potentials, and compound postsynaptic currents associated with waves can all be blocked by a variety of nAChRs antagonists (Feller et al., 1996; Penn et al., 1998). Finally, genetic deletion of the beta2 subunit of the nAChR receptor (Bansal et al., 2000) or deletion of the enzyme responsible for synthesis of ACh (Stacy et al., 2005) results in the disruption of normal waves during the first week after birth. Figure 6: Cholinergic retinal waves tile the retina. 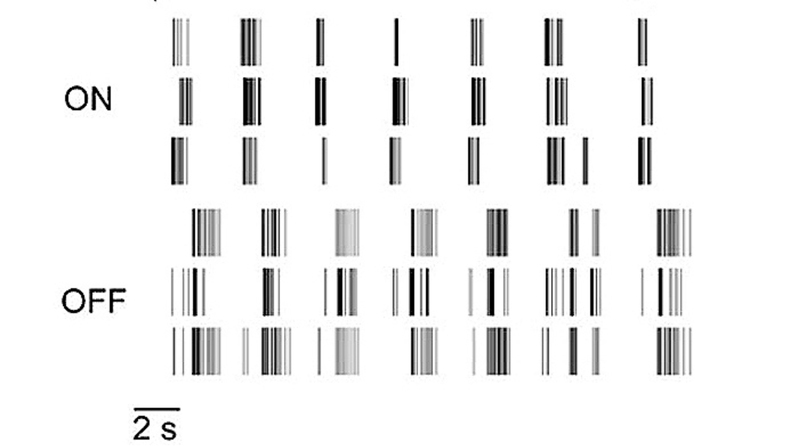 Pictured is a sequence of retinal waves that were measured using calcium imaging in a P2 ferret retina loaded with the calcium dye fura-2AM (read from left to right, top row first). This analysis is used to show that a mosaic of waves is created by sequential waves to tile the entire retina. The blue figure in the first frame represents the total spatial extent of a single wave, which is termed a domain. The red domain in each frame corresponds to a new wave arising in the same region of retina monitored with fura-2 imaging. Gray shapes represent the regions of retina that previously supported a wave. Black corresponds to overlapping regions in which more than one wave occurs. This first domain remains blue through all of the subsequent frames to demonstrate that subsequent waves initiated within 10s of seconds of that first wave do not significantly invade its territory. The fact that almost the entire region is gray after 90 seconds indicates that the entire retina is tiled but that domain boundaries change constantly over time. The entire sequence corresponds to 90 seconds of recording. The total field of view is 1.2 x 1.4 mm. From Feller et al, 1997. The spatiotemporal properties of cholinergic retinal waves have been well-characterized by fluorescence imaging of calcium indicators, which are reliable markers of cell depolarizations (Fig. 6 schematizes these waves (Feller et al., 1997). Waves initiate in small clusters of coactive neurons and then propagate over spatially restricted areas of the retina. Initiation sites and wave boundaries are distributed randomly across a given retina, indicating that the global patterns of waves are not determined by fixed structures such as pacemaker cells or by repeated activation of the same clusters of neurons. Instead, the propagation boundaries of waves are determined in part by wave-induced refractory regions that last for 40-50 seconds. These observations have led to the hypothesis that every region of the retina is equally likely to initiate or propagate a wave, and therefore the global spatial patterns of waves are determined by the local history of retinal activity (Feller et al., 1997). Recent studies in rabbit (Zheng et al., 2004; Zheng et al., 2006) and mouse (Ford et al. 2012) retina have revealed the cellular properties of starburst amacrine cells (SACs), the cell type that gives rise to cholinergic waves (Fig. 7). Identifying SACs in mouse retinas was facilitated by the use of a line of mice in which GFP is expressed in SACs (mGluR2-GFP, Fig 7A). Using calcium imaging, spontaneous depolarizations of individual SACs were observed in the absence of synaptic excitation (Fig 7A), indicating that SACs themselves may be the source of initiation for waves. Paired recording between SACs revealed reciprocal cholinergic transmission (Fig 7C), indicating that waves are propagated via these slow, excitatory connections between neighboring SACs. Finally, wave boundaries are thought to arise from a slow after-hyperpolarization in the SACs that recovers over the course of tens of seconds following the depolarization during waves (Fig 7B). Figure 7. Cellular features of starburst amacrine cells underlie the spatiotemporal properties of retinal waves. (A) Fluorescence image of an mGluR2-GFP retina loaded with OGB. Right, Fluorescence image of GFP cells. Regions of interest are shown around each SAC. Scale bar, 20 µm. B, Time course of DF/F averaged over the somas of three cells (labeled in A) in the absence (CTR, top) and in the presence of nAChR antagonist DHβE (4µM) and GABA-A receptor antagonist gabazine (5µM) (bottom). (B) Current-clamp recording from a SAC showing wave evoked depolarizations followed by sAHPs. (C) Voltage-clamp recordings from pairs of neighboring SACs show both fast slow cholinergic postsynaptic currents. Cholinergic waves may play a role in terminating early stage gap-junction mediated waves. Knock-out animals that lack nAChR receptor subunits still exhibit wave like activity under certain recording conditions, such as elevated temperature [alpha3(-/-): (Bansal et al., 2000), beta2(-/-) (Sun et al., 2008; Stafford et al., 2009)]. 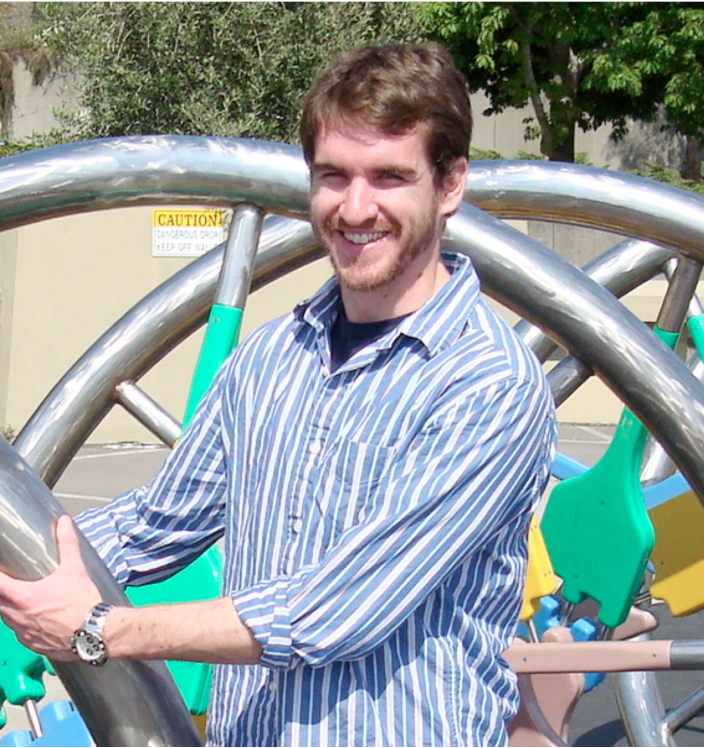 This activity is likely mediated by gap junctions (Sun et al., 2008). Moreover, a study using a genetic model that eliminates ChAT in a large portion of the retina found normal cholinergic waves in the spared region, but compensatory waves in the region lacking ChAT (Stacy et al., 2005). These studies suggest a sequential maturation of the retinal circuitry that relies on checkpoints to make transitions from one stage (gap-junction mediated waves) to the next (cholinergic transmission mediated waves). 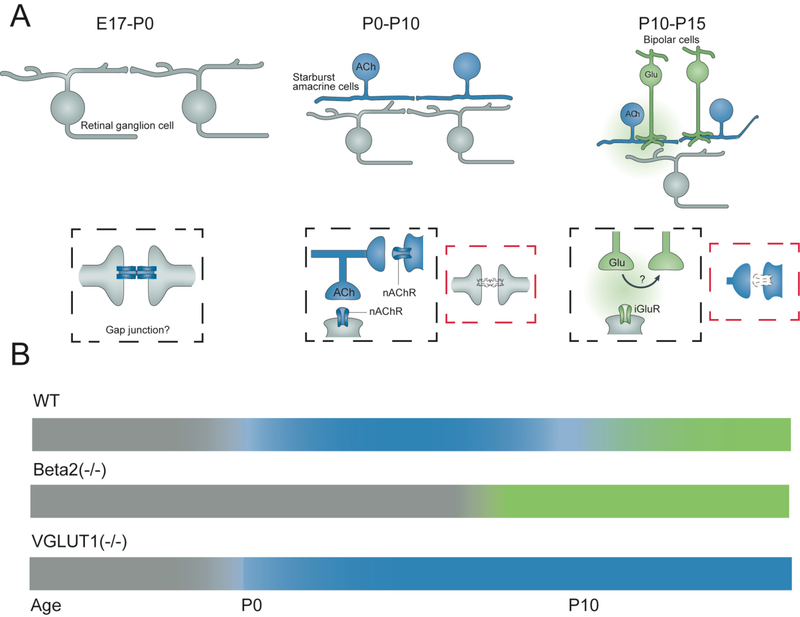 This sort of checkpoint model of neuronal development (Ben-Ari and Spitzer, 2010) is further supported by the disassembly of the cholinergic network to make way for glutamatergic signaling (Blankenship and Feller, 2010). The synaptic circuitry that drives retinal waves changes postnatally. Though retinal waves early in development require cholinergic neurotransmission, studies in older ferret, rabbit, and mouse indicate that waves become insensitive to cholinergic antagonists and can be blocked by glutamate receptor antagonists (Bansal et al., 2000; Wong et al., 2000; Zhou and Zhao, 2000). This switch in the requisite transmitter occurs at the age that bipolar cells make their initial synaptic connections with ganglion cells and conventional synapses between amacrine and ganglion cells become morphologically mature and numerous. This timing suggests that perhaps waves are mediated by neurotransmitters only when the synapses are first forming. Glutamatergic waves have distinct spatial and temporal features. Unlike cholinergic waves that drive correlations in all neighboring ganglion cells regardless of subtype, glutamatergic waves occur more frequently in OFF cells than in ON cells (Wong and Oakley, 1996) (Fig. 8). Waves occur in rapid clusters separated by periods of silence lasting about one minute (Blankenship et al., 2009). Within clusters, there is a distinct pattern of firing where ON and OFF cells alternate in firing bursts of action potentials (Kerschensteiner and Wong, 2008) (Fig. 8). These spatial and temporal features are significantly shaped by inhibitory circuits. Blocking ionotropic GABA receptors increases wave frequency (Fischer et al., 1998). Blocking glycine receptors does the same but also eliminates the asynchronous firing between ON and OFF cells. Figure 8. Glutamatergic waves occur in clusters of asynchronous ON/OFF bursts. Multi-electrode array recording of glutamatergic waves from a 12 day old mouse. ON ganglion cells precede OFF ganglion cells during burst clusters. Adapted from Kerchensteiner and Wong, 2008. Similar to the transition from gap-junction to cholinergic waves, the onset of glutamatergic waves may play an active role in the disassembly of the cholinergic circuits (Blankenship and Feller, 2010). Mice lacking the vesicular glutamate transporter VGLUT1 lack glutamate release from bipolar cells. However, these mice still have retinal waves during the time that littermate control animals have glutamatergic waves. Interestingly, these waves in the VGLUT1 knockout mice are unaffected by glutamate receptor antagonists but are blocked by nAChR antagonists (Blankenship et al., 2009). Thus, glutamate signaling from bipolar cells seems necessary for dismantling the cholinergic network. There is some evidence that the transitions between the different circuits that mediate waves are linked. Prior to birth waves are thought to propagate via gap-junctions between ganglion cells (Fig. 9A, left). From postnatal day 1-10 waves are propagated via SAC release of acetylcholine onto other SACs (Fig 9A, Middle, black box). Acetylcholine also depolarizes ganglion cells. During this period of development, the gap-junction signaling between ganglion cells is reduced (Fig 9A, Middle, red box). From P10-P15 bipolar cells release glutamate to propagate waves in a mechanism that is thought to involve spillover of glutamate to excite neighboring bipolar cells (Fig. 9A right, black box). Cholinergic signaling between SACs is reduced (Fig. 9A right, red box). Genetic disruption of cholinergic or glutamatergic waves result in an extended action of the previous wave generating circuit (Fig. 9B). In wild type mice gap-junction mediated waves (gray) are followed by cholinergic waves (blue) starting at P0, then glutamatergic waves (green) at P10. In mice lacking the Beta2 subunit of the nicotinic acetylcholine receptor, gap-junction mediated waves persist until ~P8. In mice lacking vesicular glutamate transporter VGLUT1, cholinergic waves persist through the second postnatal week. Gap junctions are thought to play a role in the generation of embryonic waves, as described above. At later ages in mammals, however, gap junctions also play a minor role in the propagation of retinal waves. Gap junction antagonists reduce or partially block retinal waves after birth in mice (Singer et al., 2001) and at later stages in rabbit (Syed et al., 2004b) when waves depend critically on chemical transmission. However, these antagonists also have several non-specific effects so these results are inconclusive. A different approach is to study mice in which specific connexins are genetically deleted (Fig. 10). Knockouts of connexins 36 and 45, the two major gap junction forming connexins in the IPL, have normal wave propagation (Fig. 10 A) but the firing between waves at later stages is increased (Fig 10B). Glutamatergic waves and the firing between waves is eliminated by the application of bipolar cell synapse antagonists DNQX and AP5, indicating that bipolar input is important for the generation of waves as in wild type retinas (Blankenship et al., 2011). Figure 10: Spatiotemporal properties of retinal waves are similar in control, Cx45, and Cx36/45 double knockout mice. A, Examples of waves recorded in different genotypes. Each grayscale value represents an active area in one frame, with darker shades corresponding to later points in time during the wave. B, Raster plot of ganglion cell action potentials taken from multi-electrode array recordings from different genotypes. Correlated firing during wave events are shown in blue. From Blankenship et al. 2011. In contrast, in the chick retina, gap junctions were found to be involved in wave generation at all ages. Octanol, a significant inhibitor of waves in E8 chick retina, restricts tracer coupling between ganglion cells and other cell types but not between ganglion cells themselves, indicating that the circuitry mediating these waves involves cells other than ganglion cells (Catsicas et al., 1998). Spontaneous activity in the developing retina occurs while functional circuits are forming within the retina and projections from the retina are undergoing refinement at their target regions in the brain. What role do retinal waves play in sculpting the circuits that mediate vision? Two sub-circuits that have been well characterized in the adult retina are the ON and OFF pathways. The classes of bipolar cells that transmit responses to the onset of light (ON responses) are distinct from those that transmit responses to the cessation of light (OFF responses). These ON and OFF circuits have ganglion cell dendrites, amacrine cell processes and bipolar cell inputs that are physically segregated from each other into what are called the ON and OFF layers of the IPL. The formation of these ON or OFF circuits involves the dendritic maturation of ganglion cell types. The dendrites of most retinal ganglion cells arborize diffusely within the IPL before restricting their dendrites to distinct lamina (Bodnarenko et al., 1999; Bansal et al., 2000; Sernagor et al., 2001; Xu and Tian, 2004; Coombs et al., 2007; Kim et al., 2010)(Fig. 11). Some studies have suggested that this segregation of ganglion cell dendrites into ON and OFF layers involves bipolar cell activity. First, this segregation is prevented by applying APB to hyperpolarize ON bipolar cells during the period of glutamatergic retinal waves (Fig. 12)(Bodnarenko and Chalupa, 1993; Bodnarenko et al., 1995). Second, mice that lack the MHCI receptor CD3zeta and thus display altered glutamatergic retinal waves have ganglion cells with reduced dendritic motility and more diffuse dendrites within the IPL (Xu et al., 2010)(Fig. 11). However, not all manipulations of spontaneous retinal activity during development alter dendritic stratification. Preventing synaptic release of glutamate from ON bipolar cells by expressing tetanus toxin does not prevent the stratification of ganglion cell dendrites, but it does reduce synapse formation onto the ON bipolar cells (Kerschensteiner et al., 2009). Is there a role for cholinergic waves in this ganglion cell stratification process? Several studies suggest that there is. 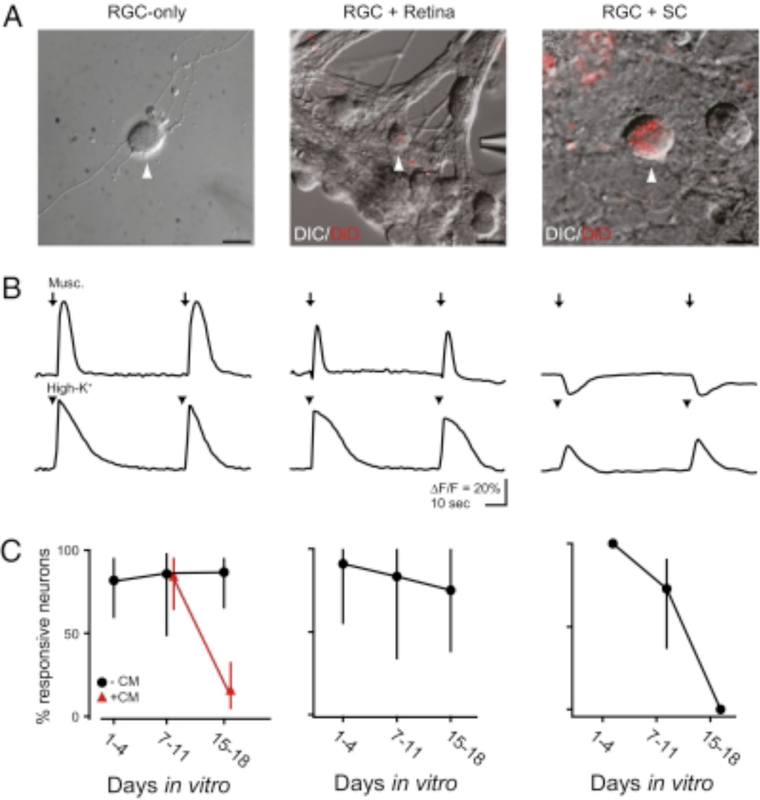 First, blocking nAChRs during the period of cholinergic waves reduces the motility of filipodia on the dendrites of ganglion cells (Wong and Wong, 2001), demonstrating that cholinergic waves can drive structural changes in dendrites. Second, studies in turtle demonstrate that blocking cholinergic waves with nAChR antagonists reduces receptive field sizes (Sernagor and Grzywacz, 1996). Finally, mice lacking the beta2 subunit of the nAChR exhibit a delay in, but not an absence of, the fine stratification of ganglion cell dendrites (Bansal et al., 2000). These findings indicate that cholinergic waves do influence the outgrowth of ganglion cell dendrites but they are not the primary factor that dictates their final organization. Figure 11. Retinal waves drive refinement of some retinal ganglion cell dendrites. Figure 12. 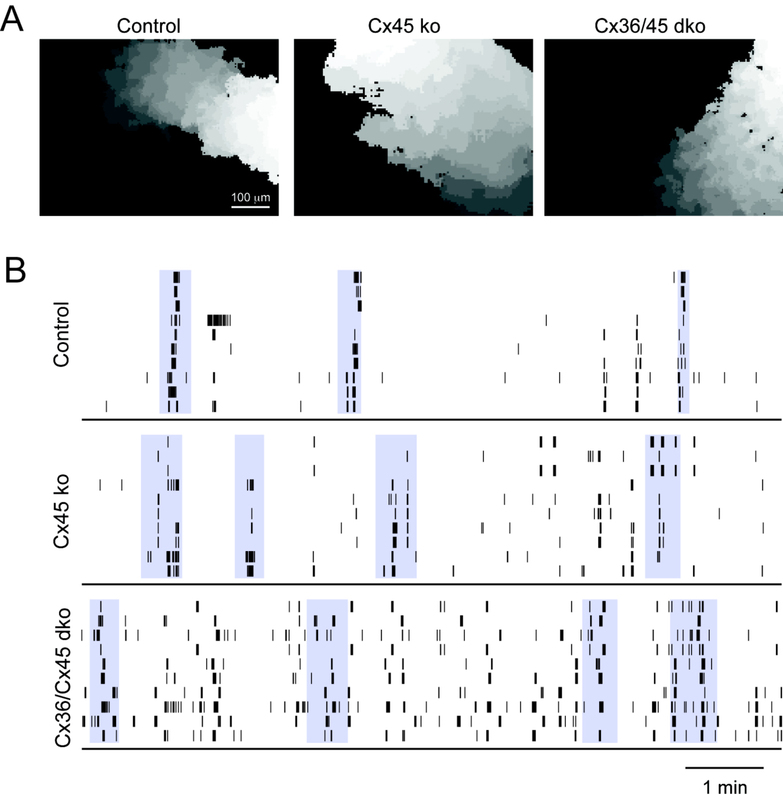 Activity dependent maintenance of ganglion cell dendritic stratification in the developing cat retina (Bodnarenko and Chalupa, 1993). Retinal axons undergo a period of refinement before vision begins. At birth in mice, axons from both eyes reside in overlapping regions of the dorsal lateral geniculate nucleus of the thalamus. By about two weeks after birth, the axon terminals from the ganglion cells of each eye separate into non-overlapping regions. Similarly, within the superior colliculus, retinal axons at birth extend over the entire area of the colliculus. However, over the course of about one week, these axons retract to their appropriate retinotopic regions and extensively arborize within a small target zone. These processes of eye-specific segregation and retinotopic map refinement occur during the period of retinal waves. Thus, the hypothesis has emerged that waves might provide cues within their activity pattern to instruct these developmental processes. The refinement of retinal projections to the brain is thought to be driven by the precise initiation, propagation and termination properties of cholinergic waves (for a review, see Huberman et al., 2008). The periodic initiation of waves induces depolarizations and calcium transients that may be tuned to drive axon guidance (Pfeiffenberger et al., 2006; Nicol et al., 2007) and plasticity mechanisms (Butts et al., 2007; Shah and Crair, 2008). Propagation speed sets the time scale over which neighboring cells are correlated, and thus may be critical for retinotopic map refinement (Chandrasekaran et al., 2007). The spatial extent of wave propagation has been shown to be important for establishing eye-specific segregation of retinal inputs within the thalamus (Xu et al., 2011). Figure 13. Retinal waves drive refinement of central projections. A. Schematic showing results of several experiments based on DiI anterograde labeling to determine the retinotopic projection of retinal ganglion cells to the superior colliculus. Results for WT mice, knockout mice lacking the beta2-subunit of nAChR, and tg mice in which b2 has is rescued in a subset of RGCs in the beta2-nAChR KO mice. B. Fluorescent images of retinal ganglion cell axon terminals from ipsilateral (red) and contralateral (green) projections. Axons labeled by fluorescently tagged cholera toxin. From Xu et al., 2011. Retinal waves determine the final size of termination zones of retinal projections to the superior colliculus (SC, Figure 13A). Focal labeling of retinal ganglion cells using DiI labels in retina (Retina) gives small target zones in superior colliculus (WT, Fig. 13A, left). In knockout mice lacking normal cholinergic waves (β2-nAChR KO, Fig. 13A middle), termination zones are less compact. Rescue of the β2-nAChR gene in a subset of retinal cells (Fig. 13 β2 tg) produce small waves, which are sufficient to rescue normal retinotopic map refinement. 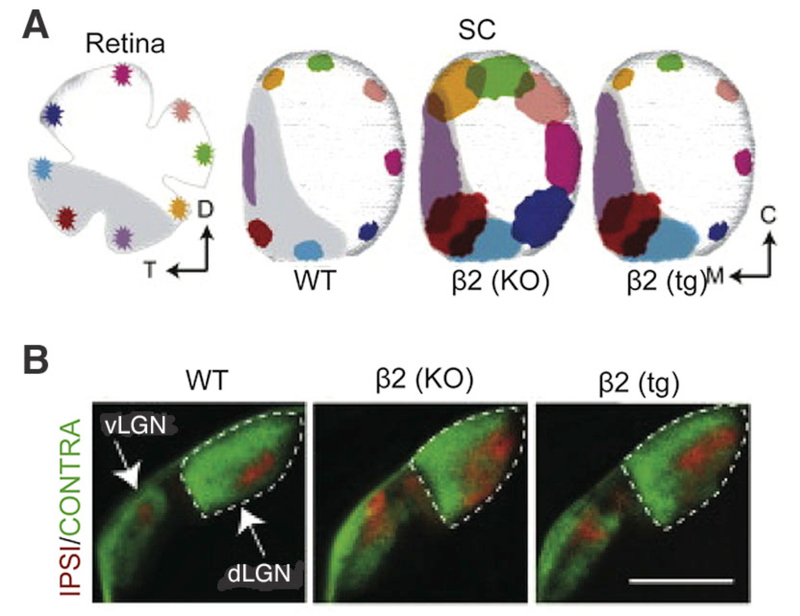 Retinal waves also play a role in eye-specific segregation of retinal ganglion cell projections to the lateral geniculate nucleus of the thalamus (Fig. 13b). 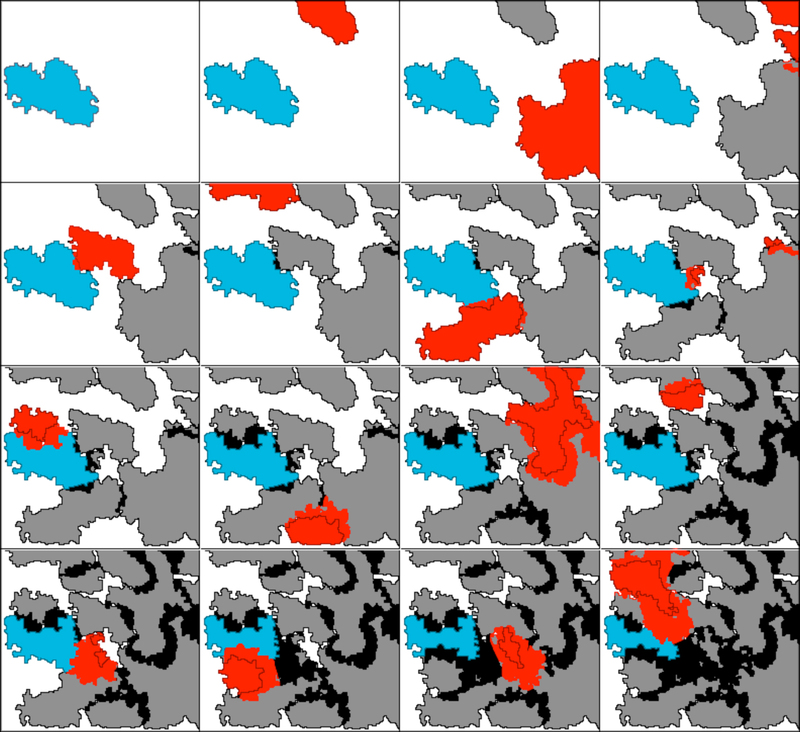 In wild type mice, there is little overlap between ipsi- and contra-lateral projections. Mice lacking cholinergic waves (β2 KO) and mice with small waves (β2 tg) have significantly overlapping projections from either eye. The neural circuits within the inner plexiform layer are highly organized, making them an ideal system for the study of circuit formation. Understanding how this organized structure and intricate connectivity arise during development is an important endeavor. It is clear that on the path to forming the circuits that mediate vision, the retina creates a series of intermediate circuits that generate spontaneous activity. These transitory circuits are then dismantled as the retina matures. During their brief existence, these transient networks play an important role in shaping the circuits both within the retina and from the retina to the brain. A wealth of new tools will lead the way to a greater understanding of how these neural circuits develop. Several recent studies have identified lines of mice with GFP or Cre recombinase expression that is restricted to specific classes and even to subsets of retinal neurons. The ability to identify and alter the activity of specific components of a neural circuit will allow future experimentalists to observe how these circuits form and to ask what role spontaneous activity plays in their formation. Last Updated: January 27, 2012. Dr. Marla Feller received her B.A. and Ph.D. in Physics from University of California at Berkeley in 1985 and 1992 respectively. 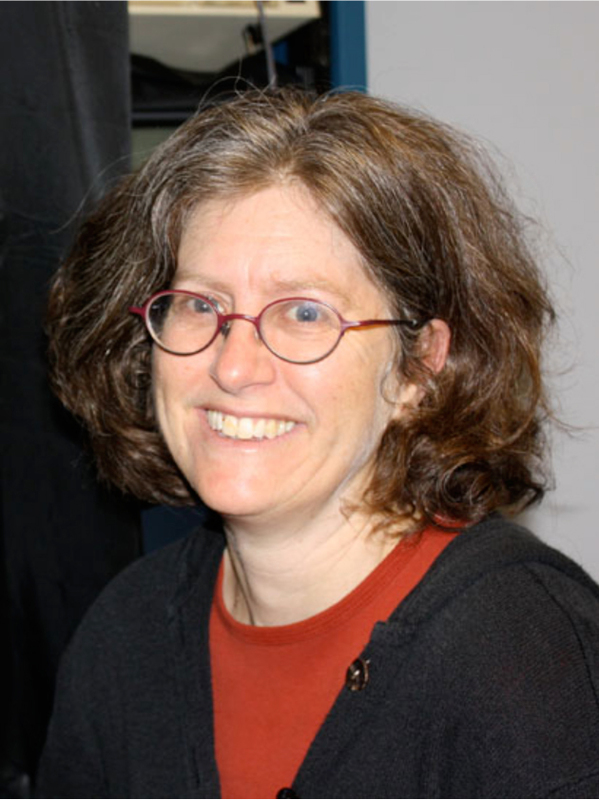 She was a postdoctoral researcher with at Bell Laboratories with Dr. David Tank (1992-1994) and then at UC Berkeley with Dr. Carla Shatz (1994-1998) She headed a laboratory at the National Institutes of Neurological Disorders (1998-2000), was at UC San Diego (2000-2007) and is now at UC Berkley Neuroscience as an Associate Professor of Neurobiology. She has done research in the elucidating the circuits that mediate retinal waves and also in what role retinal waves play in the establishment of retinal projections to the brain. Currently Marla is investigating the mechanisms underlying the generation of this highly patterned activity and exploring the role it plays in the development and shaping of ganglion cell responses, particularly those generated by a cholinergic amacrine cell network.